Scientists from the University of Hawaii are now tracking over a dozen tiger sharks, and allowing the public to see where they’re located via the web. The team, based at the UH Hawaii Institute of Marine Biology (HIMB), completed the first phase of a project to observe the movements of 15 tiger sharks caught and tagged around the island of Maui. In response to an uptick in the number of shark attacks recorded on Maui, the State of Hawaii’s Department of Land and Natural Resources (DLNR) is funding a study on the movements of tiger sharks caught and released around the Valley Isle. DLNR plans to use the results of the study to guide future decisions regarding management of shark populations in Hawaii. Lead scientists Drs. Carl Meyer and Kim Holland report that in late October, the shark research team caught and released the tiger sharks in waters off the south shore of Maui. Eight of these sharks were equipped with satellite transmitters to track their movements. To help disseminate the results to the public, the Pacific Islands Ocean Observing System (PacIOOS) is launching a web page that shows the movements of the tagged sharks. 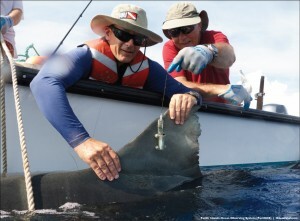 The page will also include sharks tagged in the future as the project progresses. Based within the School for Ocean and Earth Sciences and Technology at the University of Hawaii at Manoa, PacIOOS is the Pacific Islands regional component of the U.S. Integrated Ocean Observing System (IOOS). PacIOOS is a partnership of data providers and users working together to enhance ocean observations and develop, disseminate, evaluate, and apply ocean data and information products designed to address the environmental, economic, and public safety needs of stakeholders who call the Pacific Islands home. When will you stop the shark “attack” terminology? If it was an attack, the shark would finish the job and make a meal of it. A shark “bite” or shark “encounter” is the result of a shark “spitting out” and untasty person after finding they’re not really good for dinner. And no sympathy from me for people who go out into shark territory on a surfboard, disguised as a seal, their “real” food.